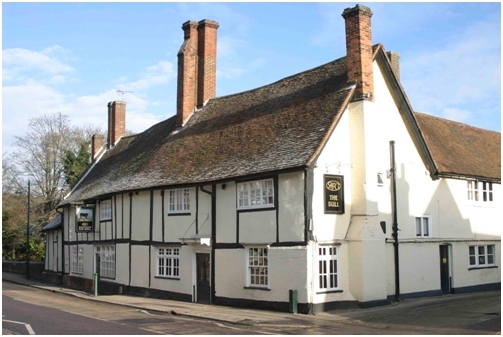 The earliest record of the Bull Inn dates to 1617, though it was originally a group of 16th century buildings. The Inn came with 119 acres of land belonging to the manor of Lamer, which lies to the north of the village. It was timber-framed with a plastered exterior and was later extended to include two riverside cottages. The then-royalist General Monck (Coldstream Guards) is said to have stayed here during the Civil War (1642-1651). In 1667 Roger Austin, an unfriendly landlord, came to the notice of the Quarter Sessions - once for refusing accommodation to Nicolas Brooks, a finshmonger from London, and on another occasion for not looking after his wife Elizabeth and their sons, Meshach and Abednego. The 1841 census shows that the landlord at that time was William Hooper, aged 65. He and his wife Joanna came originally from Cornwall. She was landlady in 1851 and their daughter Eliza was landlady until at least 1881; her sister Annie Scarborough had taken over in 1891. Until well into the 20th century, what is now the pub car park was Bull Yard. It was surrounded by buildings on all four sides, with an entrance from East Lane.